What Makes a Battery Work? Condition: It is the lightest and least dense metal found in solid elements. Reactivity: Highly reactive, corrodes quickly in moist conditions which eventually forms a black tarnish. Storage: Stored under a cover of petroleum. Caution: Lithium in its elemental state is extremely flammable. Lithium batteries are usually disposable with lithium compounds as an anode. Lithium niobates (lithium, niobium and oxygen) are used extensively in telecommunication products such as mobile phones and optical modulators. Lithium chloride & lithium bromide are extremely hygroscopic (the ability of a substance to attract water molecules from the surrounding environment through either absorption or adsorption.) and are used as desiccant (Induces or sustains a state of dryness in its local vicinity in a moderately well-sealed container). Used in preparation of organo-lithium compounds to create strong bases in opposition of strong alkaline composites. Promotes the fusing of metals while eliminating the forming of oxides by absorbing impurities from the base elements. Lithium fluoride, artificially grown as crystal, is clear and transparent and often used in specialist optics for IR, UV and VUV (vacuum UV) applications. Sometimes used in focal lenses, including spectacles. Its complex hydrides, such a Li[AlH4], are used as high energy additives to rocket propellants. Lithium deuteride was the fusion fuel of choice in early versions of the hydrogen bomb. Lithium fluoride (highly enriched in the common isotope lithium-7) forms the basic constituent of the preferred fluoride salt mixture (LiF-BeF2) used in liquid-fluoride nuclear reactors. There are hundreds of ways that lithium has become integrated into our lives. It can be found within the battery of your Mp3 or within the circuitry of your laptop. In fact, even the electric car is powered by lithium. Green cars are slowly taking over diesel cars as the world becomes more informed about global warming and other environmental concerns. The demand of lithium will also see a spike in the coming years as more and more lithium is needed to meet that demand. This is something that many investors are eying as the look to the future of lithium. So, what does make a battery work? Usually, polarization of electrons is found on the negative terminal segment of the battery. Whenever a wire is connected between the negative & positive segment of a battery, the electrons will start to flow towards the positive terminal as quickly as possible. This process will deplete the energy levels of a battery rapidly and as the battery size increases, the energy-creating process becomes more dangerous. Generally you will have to connect a load to the battery while using the wire. A load can be a light bulb, a motor or even an electronic circuit. Within the internal structure of a battery, the chemical reactions will produce electrons. The rate of electron production during the chemical reaction determines how much electrons are able to flow through the terminals. The electrons start to flow into the wire, after which they will travel from the negative end to the positive terminal to initiate the chemical reactions. This is the main reason why batteries are able to sit a shelf for long periods of time and still retain their energy source. It is only when the electrons are flowing from the negative end to the positive terminal that the chemical reactions occur. Significant amounts of lithium can be found in South America but is especially prevalent in the Andes mountain chain. Chile is near the top of producers of lithium metal in the world, followed closely by Argentina, acquiring their lithium stores from enriched brine pools found in Playa deposits. Almost half of the global resources of lithium are in Bolivia, and according to research done by the US Geological Survey, the Uyuni Desert in Bolivia has approximately 5.4 million tons of lithium. Within the United States, lithium is also recovered from brine fields, with the only current domestic producer being in Nevada. Of the four or five areas with Lithium brine potential, the United States has the easiest access, the most infrastructure in place, manageable climate conditions, and a government conducive to exploration and development of clean energy sources. 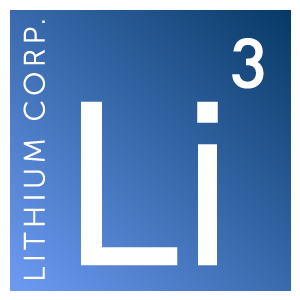 To date, all of Nevada-based Lithium Corporation’s properties are located within the continental United States. The price of lithium, which is not widely published, reached about US$6,600 a tonne in August 2009. That compares with about US$2,500 a tonne at the beginning of the decade. Public Broadcasting reveals, “The price of lithium has increased eightfold in the last six years.” And the price will continue to increase aggressively as demand rises for this energy source. Lithium is here to stay, and it is growing a rapid rate. View our current stock price. The market for lithium has grown steadily over the past decade because of the increased use of lithium batteries in consumer electronics such as cell phones, laptop computers, and other handheld electronic devices. Famous gadgets such as IPods and Blackberries are rapidly turning to lithium as their main source of energy as it is convenient, light and reliable. But it is the pending releases of the Chevy Volt, the Nissan Leaf and Mitsubishi’s electric car concepts that have been generating excitement among many investors. Some auto companies are speculating that pure-electric cars could make up 10% of vehicle purchases by 2020, with automotive giant General Motors’s getting a major slice of the lithium pie. Companies like Apple, Motorola, Research in Motion, Hewlett-Packard, Dell, Samsung and Sony all use lithium in most, if not all, of their products.